The high cost to keep your home warmer in winter and cooler in summer is now much more affordable with our three low-cost radiant thermal products now available from the company that designed them: ClearDome Solar Thermal in California. These unique thermal products are all UV resistant, non-toxic and safe to use. They are the first of their type designed for multiple passive thermal uses like growing food. and our compact hydroponic Veggiegarden2go. Learn more about our other custom designed diffused reflective foil that can be used with both growing systems or your own to help grow food or pot faster and larger. Its called SolarReflexx 97% diffused reflector foil and it reduces shadows and increases overall light distribution, especially for interior grow lighting. Our Black Solar Heating Drape fabric, right photo and explained below, is our most popular and most affordable home solar heating product made. It is very durable, and easy to install and remove. Shown in the photo on the left is our tough 75% reflective Thermal Barrier Fabric that can be used in both summer and winter, indoors and outdoors, to restrict the natural flow of heat radiating inside when it's warm or trying to flow out a window when it's cold. Room air temps will rise as much as 10 degrees in the winter with the same amount of heat indoors when all windows in a room are covered. It's made of a weaved, super tough high density polyethylene plastic that's coated with a thin, highly reflective metallized surface. The most effective winter use is hanging it on the inside of windows or skylights, where 50% of a building's warm air is lost to the cold outdoors. It comes with easy to attach suction cup hooks that are placed on the four corners of the glass for quick fabric mounting. It can be sewn for drapery rods or hung outside of cloth drapes for increased performance. Nearly half the incoming light will still enter the room and you can still see outdoors through the fabric. The three scenes below demonstrate Thermal Barrier Fabric's exterior cooling ability on a green painted wooden patio deck. The fabric has optional grommets and edge trim (suggested for outdoor use) and is hung from ropes on one side (shown) and attached to the wall with screw hooks on the other. This was on a sunny 74 degree F day in summer. This type of filtered light is ideal for plant growth. It also provides excellent cold weather frost protection for potted and garden plants and trees. 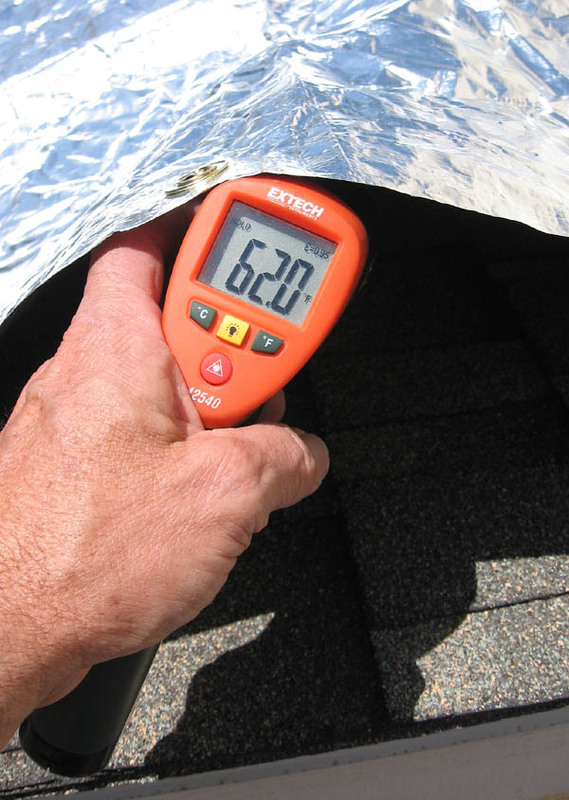 Notice the 62 degree difference between the sunlit (left) and Thermal barrier(center) shaded side. We now offer PayPal secure online ordering exclusively, so please click on each PayPal order link below to place your order. A wide view is on the right. For more information on how to use and sign on to PayPal please click on the links below. We also accept money orders through the mail. 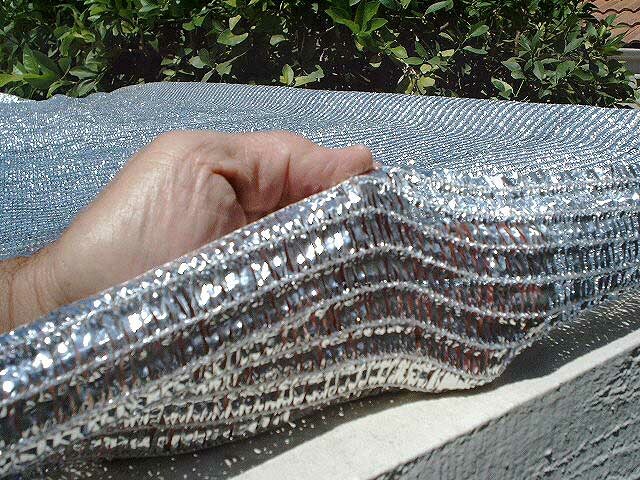 Click link to order the reflective $98-7x8 thermal barrier fabric with Safe & Secure PayPal. Two small pieces of either fabric can be shipped for the same shipping fee. 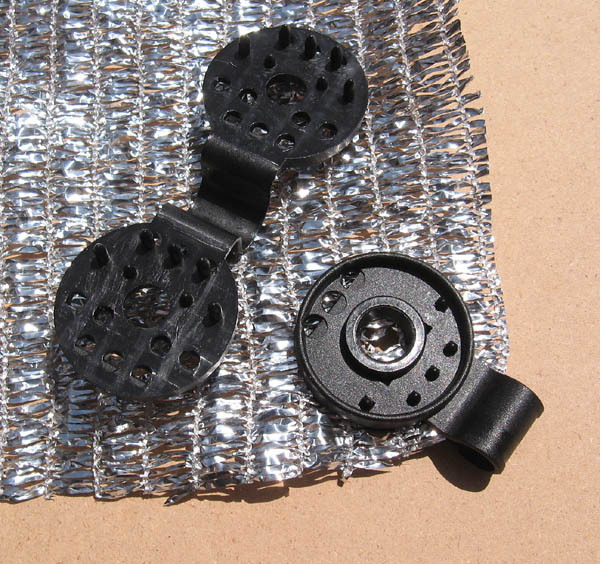 An easy way to attach the fabric to hooks or supports is with these strong, reusable grommets for both the Solar Heating Drapes and Thermal Barrier Fabrics. Each grommet, seen on the right, has 14 pins that pass through the fabric for strong holding in moderate wind. We suggest one grommet every 2-3 feet and on every corner for the best support. The large hole at the center of the grommet and the end loop are both 1/2" round. They can be ordered from the PayPal order link above. Each fabric comes with a few suction cup hooks that can hold the fabric near glass. The photo below shows our standard 7' X 8' small Thermal Barrier Fabric. Both small size fabrics sell for $98 and can be ordered by clicking on the PayPal links above. A larger precut size of Thermal Barrier Fabric measuring 14' x 20' sells for $295, and even larger bulk sizes are available on request. 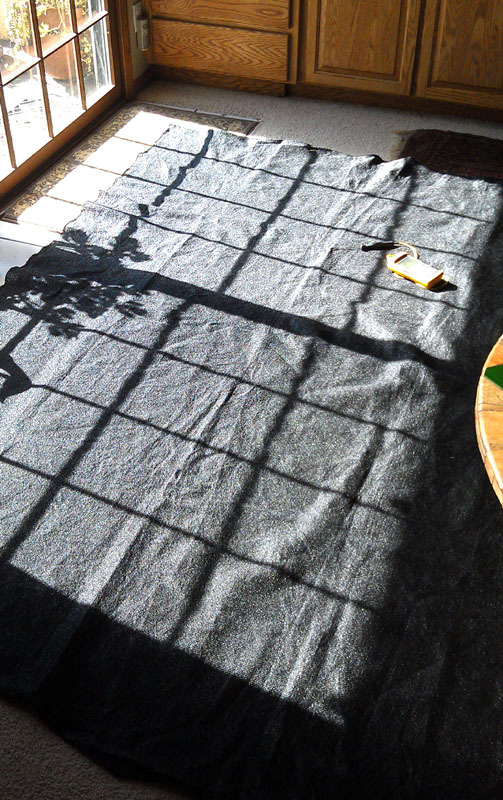 All sizes and fabrics can easily be cut with scissors to fit any size window and will not unravel after being cut. Add about 3-5" length and width to allow for slight edge curling. It can also be used on outings and camping trips to reduce summer heat and sun over tents and in the open. 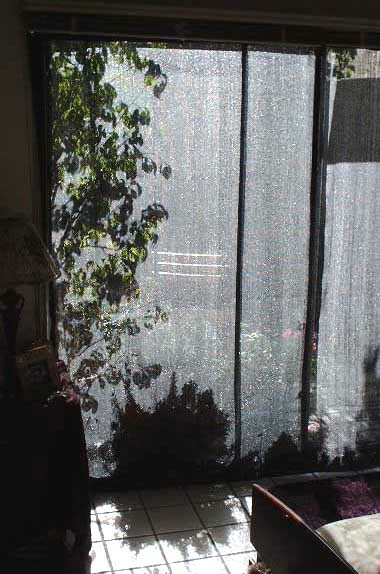 The photo below shows it hung as an exterior curtain on a patio door, which in summer reduces heat penetration to the inside by 70% while dropping the light transmission by slightly less than half. It can also be placed over a patio cover, used as window awning, or suspended by hooks or ropes, (photos above) with the same results. As an indoor curtain it keeps most heat indoors at night, or on north facing windows during the day, drastically reducing heating bills. In numerous cold weather tests, when the outdoor temperature at night was 31 degrees and the inside bare glass temperature (double pane glass) was 56 degrees, the temperature on the room side of the radiant barrier fabric was a warm 71 degrees, only one degree cooler than the insulated inside wall temperature. A series of tests by an environmental testing agency in Missouri with 25 degree temps outdoors showed the same results, the same as another customer in Minnesota. It's better than adding an insulated wall to the inside of the glass becaused instead of absorbing the heat, it reflects it back into the room. Outdoors, it can be also be used for screens over windows or as a temporary summer thermal shadecloth on a roof or greenhouse to reduce solar heat gain while passing 45% diffused light that's ideal for plant growth. As an added benefit, 15 mph winds will slow to only 2-3 mph behind the fabric outdoors on your next outing, which nearly eliminates the wind chill effect on cool days. No other thermal barrier-related fabric offers this many benefits for controlling temperatures both outdoors and indoors. At only two pounds, the small piece is easy to install and remove. The only other competitive thermal window coverings available cost about 8-10 times the price of our standard size, with nearly 100% sun blockage, and cannot be used outdoors or in wind control situations. Solar heating drapes turn sunlit windows or floors into giant solar radiators and melts snow & ice! Now your sunlit windows or floors at home, in your RV, boat or camper can be transformed into giant solar radiators with our new interior radiant Solar Heating Drape fabric. It can also be placed over snow or ice outdoors in sunlit areas to increase melting--even on freezing days. It is completely safe to use. 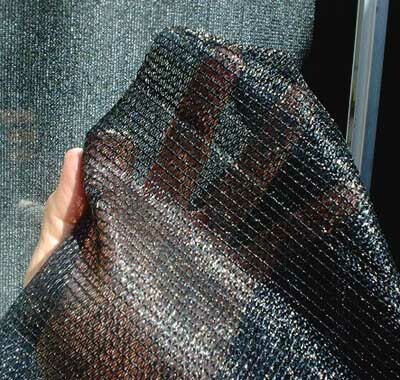 Instead of being highly reflective like the thermal barrier fabric, it is a specially designed deep black, heat and UV resistant HDPE (non-toxic, high density polyethylene) plastic attached weave fabric specially designed to absorb solar energy and efficiently convert it to heat. These are not blackout curtains. Filtered sunlight will enter the room and the outdoors is visible from the inside during the day. When positioned near a glass surface, peak winter midday temperatures as high as 145 degrees F degrees are generated and radiated back into the room as long as direct sunlight touches the heat absorber surface. If you prefer to not obstruct the view outdoors, just lay the drapes flat on the sunlit floor near windows (center photo). Stand near this unique solar heating fabric and you'll feel the sun's soothing heat radiating up and around you, coming from the fabric. 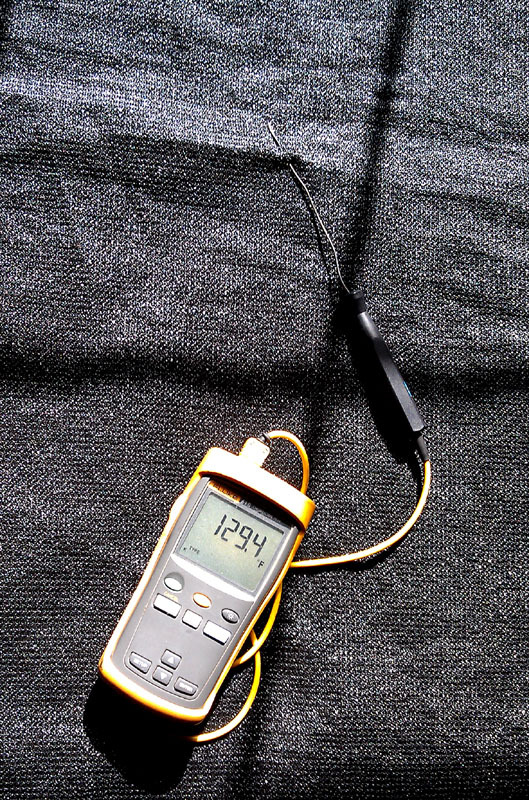 As you can see in the right photo, the surface of the fabric reached over 129 degrees F, laying on top of carpet when the outdoor temps were in the low 50's in the middle of sunny winter day. It will not damage carpet or flooring and will not harm humans or pets, which will discover this is the warmest place to stay on cold days. When installed on windows or glass doors, the glass and fabric will warm much higher than the ambient room temperature and very little heat will radiate out the windows, so they both become thermal barriers to help keep room temperatures warmer. Hot always travels to cold, so the radiant heat inside the room is absorbed by cooler walls, the floor and furniture, and is stored for release back into the room at night when the temperature drops. 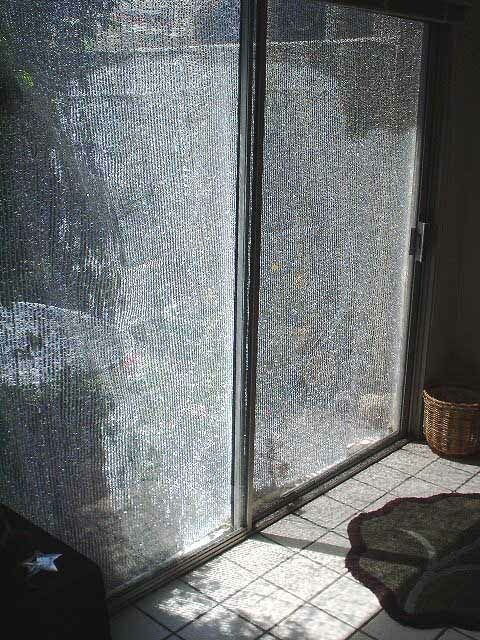 Also, most or all moisture condensation on the glass is eliminated on solar drape covered sunlit windows, reducing window frame damage and mold formation on the frames. The drapes can be cut to fit any window size and attached with wall mounted hooks, hung on curtain rods, or hung from the included suction cup hooks that attach to the window glass. To melt snow or ice outdoors in sunlit areas just lay the drapes over the snow or ice covered area such as a driveway or walkway and place rocks or bricks on the corners to prevent wind from lifting the fabric. It is unaffected by freezing temperatures or moisture. This durable solar heat absorbing fabric will not unravel after being cut and is available for purchase in two standard sizes and larger bulk sizes over 500 square feet. It's only $98 plus shipping for the standard 6' x 9' patio door size or $295 for the larger 12' x 22' size--four times larger than the small piece. Much larger unlimited bulk sizes of both fabrics can be special ordered at a discount by sending your email request. Click to order small black $98-6'x 9' solar heating drapes or floor covering using safe & secure PayPal. Two small pieces of either fabric can be shipped for the same shipping fee. For even more protection from extreme high and low temperatures, have a look the world's most solar reflective and coolest solar Cooltarps made for roofs, walls and any other surface or area exposed to the direct sun. They are about 20-25% more reflective than Thermal Barrier Fabric and are sealed and close weave, but very flexible and waterproof. They are called SolaReflexx and Snow White CoolTarp (click for more details) and they come with optional grommets for easy installation anywhere in the hot sun. They will passively cool spaces underneath the hot summer sun even better than Thermal Barrier Fabric by reflecting nearly all the blazing sunlight away from patios, tents, over roofs, RV's and boats, carports, work spaces, animal enclosures, and garden areas that are warmed by too much sunlight. Areas below CoolTarp will stay within about 10-15 degrees of the ambient air temps. Unlike typical painted or light colored tarps that absorb the sun's energy and get very hot underneath in summer sun, one CoolTarp is made of our top-rated reflective metalized SolaReflex specially coated on both sides of a rip-stop type plastic sheet that allows only a very small amount of heat to pass through, and no light, keeping that surface and space below it cool. Snow White CoolTarp is more durable with a 23 mil thickness, and allows only a small amount of light to pass through it's super-reflective white surface. © 1999-2019, ClearDome Solar Thermal , 30650 Rancho California Rd., Ste. D406-104 Temecula, CA 92591 U.S.A.· .